The models for this composition were the Balinese Legong dancers, Cawan and Sadri, cousins who trained together from the age of five. The artist wrote of the dancers, 'because of their training and performances take up so much time and because the arranging of the performances and the transports to other villages are difficult if they are separated, Sadri was adopted by Cawan's father. They live together and can hardly ever be seen without each other'. 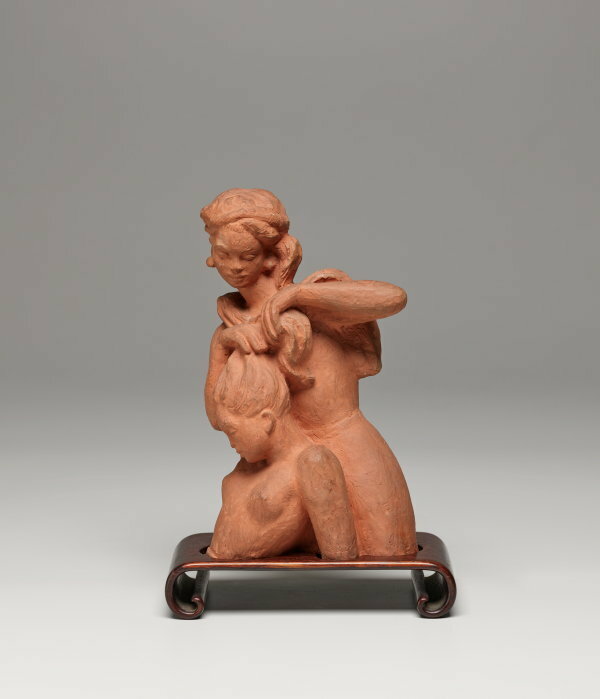 Of this sculpture Fleischmann notes, 'This terracotta shows a very typical attitude of the Balinese girls who, sitting on the steps of their Kampung entrances, are doing each others coiffures after having hunted through one another's head'. Fleischmann created a number of small plaster, wax and terracotta maquettes depicting the Balinese dancers Cawan and Sadri. 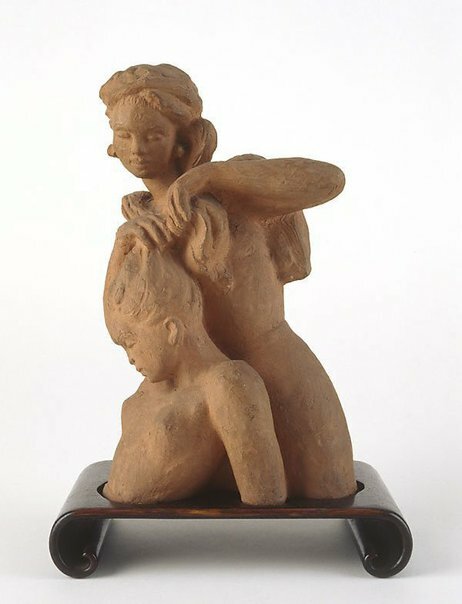 A bronze sculpture, cast in 1939, 'Hairdressing in Bali' is in the collection of the Queensland Art Gallery, and depicts the dancers in the same intimate composition. Tatlock Miller, Catalogue for the Inaugural Exhibition by the Merioola Group of Sydney , Melbourne, 1947. possibly cat.no. 2; titled 'Hairdressing'; priced 80 gns. Anne Ryan, Look , 'Sydney links London and Bratislava', pg. 19-21, Sydney, Sep 2003, 19 (colour illus.). Unknown, Bali through a sculptor's eyes: Arthur Fleischmann 1896-1990 , St. James's, 1994, 18-19. cat.nos. 7, 8, and 9 are similar sculptures of the dancers Djavan and Sadri, which Fleischmann produced between 1937 and 1939 while living in Bali.